Lavender Jazz, Goshen College’s resident big band, has established itself as a staple of GC culture but there is more to them than just jazz. Attendees of Lavender Jazz concerts will hear not only jazz standards, but pieces in diverse styles such as swing, blues, world beat, New Orleans, and jazz fusion. This year the group is made up of 10 people, though the number varies by year. A select group of five students form the Lavender Jazz Combo, a student-lead ensemble which prepares and performs additional music. The 2018-2019 Combo is made up of Nathan Berkey (bass), Gabe Miller (piano), Simon Hurst (guitar), Ben Good-Elliott (saxophone), and Tyrus Tucker (percussion). In Lavender Jazz’s upcoming concert, the Combo will be playing their own set of five songs. Chris French directs the Lavender Jazz large ensemble. French is resuming the position this fall, after Goshen College and Lavender Jazz alumnus Greg Smucker stepped in as guest director last spring. Bringing a multitude of experiences, French is an accomplished clarinetist, flutist and saxophonist. He holds two degrees from the Juilliard School. In addition to his work at Goshen College, French is a faculty member of Indiana University South Bend and St. Mary’s College. The Lavender Jazz Combo most recently performed at the Goshen Theater, Oct. 5, in downtown Goshen. The performance was part of Goshen College’s Homecoming Weekend and the City of Goshen’s First Friday festivities. It marks the ensemble’s first performance of the academic year. “The [First] Friday performance was a great opportunity for the Combo to get to know each other a little better and share music with the Goshen Community,” said Miller. Listening is crucial when playing jazz, as the genre is full of opportunities for musical improvisation. 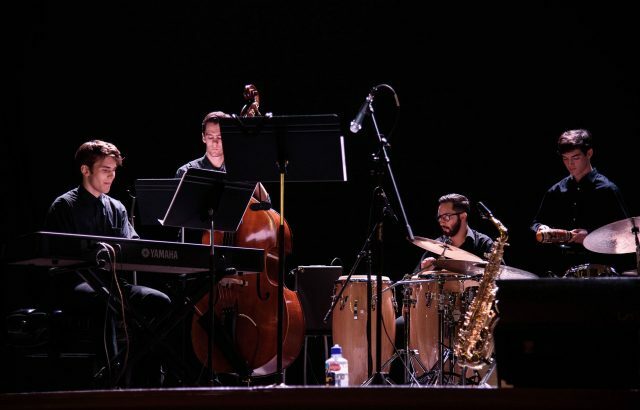 Taking full advantage of the potential for improvisational solos “allowed us to create more interesting musical ideas and communicate better overall,” Miller said. The First Friday/Homecoming show featured vocal accompaniment by Lucia Martinez and Naomi Peters in a number of pieces. “We hope to do more work with vocalists and other instrumentalists moving forward,” said Miller. As far as future performances go, there are plans in the works. Miller mentioned a performance near the end of the semester — perhaps even a joint effort with the student lead folk band The Eighth Day. However, “nothing has been set in stone, yet,” Miller said. Lavender Jazz’s next performance with the GC Wind Symphony will be at Sauder Concert Hall; Nov. 16, at 7:30 p.m. Tickets will be $8 for adults and $6 for seniors/students. Admission is free with a valid GC ID card. Kory Stoneburner-Betts is a staff writer for the Record. You can reach Kory at kjstoneburnerbetts@goshen.edu.